But before we get too far into Fallout 4, let's take a look at where it all started and see just how far it has come over the years. The series has been at the hands of many different developers and studios, and has been shaped into the unique and incredible experience that we know it as because of that. Fallout features a world strikingly similar to ours. The key differences come in after World War II. During the Cold War, the United States adopts a system of 13 Commonwealths to counter the growing "Communist threat." China never establishes a free market economy, causing it to stay the same as it was under Mao Zedong. The USSR does not collapse in 1991. Demand for oil skyrockets and reserves run low, causing turmoil all across the European Commonwealth. A wave of disease spreads across America as its own oil reserves are depleted, and "Project Safehouse" is initiated after Israel is attacked with nuclear weapons. America constructs Vaults as per Project Safehouse to shelter people from a nuclear attack and to sustain them long enough for nuclear fallout to subside. Shortly after, China decides to invade Alaska in an attempt to gain more oil to help its struggling economy. This sparks the Chinese-American war, which lasted until 2077 when America finally reclaimed Alaska. When no armistice was signed, however, some foresaw nuclear retaliation; and when the warning sirens blared across the country, it was already too late as the Vault doors were shut tight. Fallout is the first entry into the series though is it considered to be the spiritual successor to Wasteland, and it played much differently than the games we know and love today. It was released in 1997 by the studio known as Interplay Entertainment. Fallout had you play as a vault dweller who must venture out from the safety of the vault out into the wasteland to retrieve the Water Chip, an item that will fix the vault's water production and save the inhabitants from running out of water. If you didn't already know, Fallout was not always the first-person shooter that we know and love today. 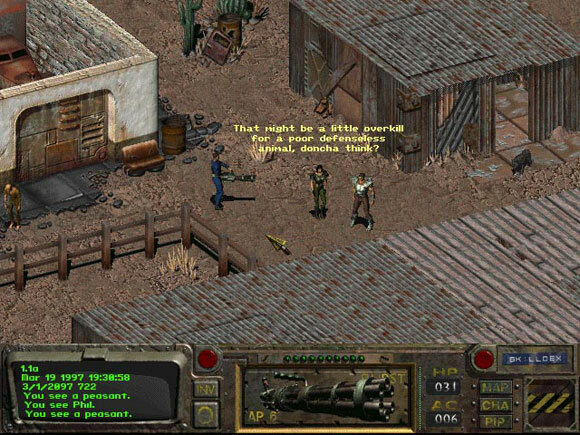 In the first Fallout, it is actually a point-and-click game played from a high camera angle. You are able to use stealth and diplomacy to avoid combat but if that's not an option, then you would enter into the game's turn-based combat style where your stats, equipment and strategy would decide whether you lived or died. And it definitely didn't hurt to be too prepared in a game like this. Fallout 2 was released in the following year after the first Fallout. You play as a descendant of the player-character in the first game, in a village known as Arroyo set 80 years after Fallout. Being the descendant of a hero, your village elder tasks you with finding what is known as the Garden of Eden Creation Kit (G.E.C.K.) which is said to be able to create life in the wasteland. Things quickly become complicated when the Enclave (remnants of the old U.S. government) takes over the player's village, and the player must set out to dismantle the Enclave and save their village. Fallout 2 featured many improvements to its predecessor. It utilized a newer game engine and expanded greatly on companions and people you interacted with. It also added a key chapter in the Fallout universe, which included the origin of the Super Mutants and the agenda of the Enclave. Fallout 2 set the stage for many future releases by showing us the Enclave, the Brotherhood of Steel, the NCR and many other groups and places that are now a significant part of the Fallout universe. Even though almost 200 years had now passed since the Great War, the next game in the Fallout series would go out of its way to show us that war... War never changes. In a growing financial crisis for Interplay Entertainment in 2004, they began selling their intellectual property rights to other developers to avoid going bankrupt. Bethesda Game Studios had purchased the rights to create three of their own Fallout titles. In 2006, however, Interplay was issued an involuntary bankruptcy order. Interplay then sold the entire Fallout franchise to Bethesda who would start working on Fallout 3 later that year. Fallout 3 is arguably the best addition to the series and is widely considered to be one of the best games of all-time. The third Fallout was released in October of 2008, after the series had not gotten a main release for 10 years. The game gave old Fallout players a familiar start: you are exiled from the vault you were born in, taking the punishment for your father who mysteriously left. The player travels across the barren wastes of Washington D.C. in the year 2277, exactly 200 years after the Great War started and ended in search of their father. Fallout 3 saw the most dramatic changes to its gameplay. The previous Fallout titles were games with nearly a bird's-eye view camera angle, point-and-click story controls and turn-based RPG combat. Bethesda envisioned a destroyed world that you would experience through the player-character's eyes, where exploration was risky but important, and your skill in combat was absolutely crucial. They also wanted the player to feel completely free in their actions and choices, and you were always given at least two choices in every situation. Fallout: New Vegas was developed by Obsidian Entertainment and published by Bethesda Softworks in October of 2010. Obsidian Entertainment contained several developers from Interplay Entertainment, so the stand-alone game was in good hands during development. Fallout: New Vegas received mixed criticism, but fans of the series and especially of Fallout 3 did not voice many complaints. Fallout: New Vegas created a compelling story, pitting you as a courier in the Mojave desert in the outskirts of what remained of Las Vegas. The story starts with you getting intercepted on a delivery job, where a man in a suit leading a group of raiders expresses his fake sympathy to you as the raiders are digging a grave for you. The scene ends with the flash from his pistol, but unfortunately for this would-be assassin, you survive. Fallout: New Vegas made a lot of changes that fans had wished to see in Fallout 3, most notably the addition of iron sights on weapons. A faction system was also introduced, which played a major role in which ending you got. It also gave the player a sense of being a part of something, especially those who had seen the NCR in Fallout 2 or the Brotherhood of Steel in Fallout 3. The DLC expansions provided fans with a substantial amount of content and an excellent story to uncover about the courier's past. After a dreadfully long silence over when we would see the next Fallout, fans finally received an answer in June of this year when Bethesda revealed a teaser on the Fallout website. The teaser showed us a slide that read "Please Stand By" with a countdown clock, ticking down to what would be the teaser trailer for Fallout 4. The entire game has been built from the ground-up, with a new version of their Creation engine made solely for this game. The combat and leveling has been redone and we can expect to see improvements all across the board for everything we enjoyed in previous titles such as stealth, persuasion, item customization, companions and many other features. Fallout 4 also features a unique "face-sculpting" system for character customization, allowing you to make a truly realistic looking character to play as. Fallout 4 will be the first entry in the series to feature a voiced protagonist. You will hear your interactions with other characters, instead of reading them like you did in previous Fallout titles. There are even more than 1,000 prerecorded names that NPCs will refer to you as, and Bethesda has had plenty of time to work it all out in the seven years that this game has been developed in. Fallout 4 will start in 2077, before the bombs drop, and you will come out of the vault 200 years later in the post-apocalyptic Boston. The game will be released on November 10, 2015. Over the many years since Fallout's inception, it has undergone a huge amount of changes. What fans of the series used to know as Fallout with the first two releases, is much different than the Fallout we see with today's releases. 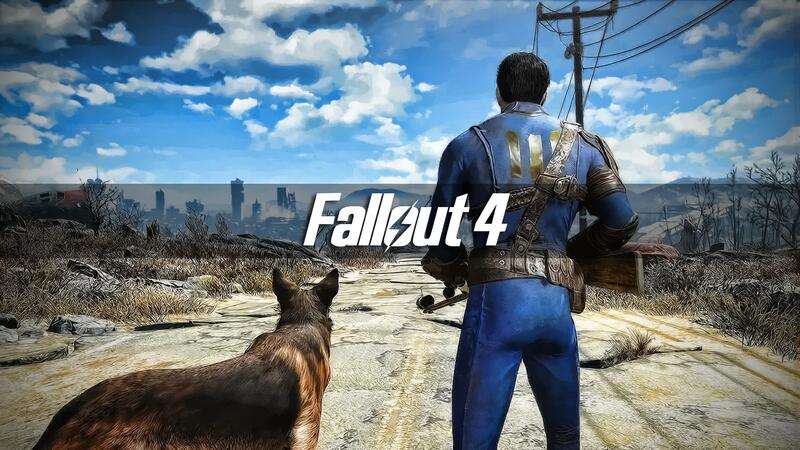 So what do you guys think about Fallout 4 from what we've seen so far? Are you happy with the direction that the series has gone in since Bethesda obtained rights to Fallout? Do you think that war will ever change? Johnny Quasar, The Scorpion, Adolfin and 23 others like this.